Strip-a-Kit Decal and Paint Remover. 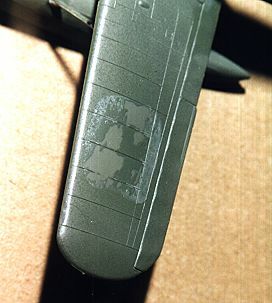 Strip-a-kit is touted to remove all kinds of paint, chrome and decals from kits without damaging the plastic underneath it. I was sent a sample to try. Strip-a-Kit (SAK) is a gel that is supposed to be applied with a soft bristle tooth brush, left for 15-25 minutes and then washed away. The instructions recommend wearing latex gloves as it is slightly caustic, and I did so. Here are the results of a few tests. The first thing I tried it on was chrome. I have tried the Polly S material that is supposed to remove chrome, but it had absolutely no effect. A chrome plated part was dipped in SAK and left for a few minutes. When I returned, all traces of chrome were gone!! As you can see, there is no chrome plating left where SAK was applied. SAK is also biodegradable, which means it can be safely flushed with water. It is a whole lot safer than using oven cleaner!! In addition, it did not harm the glue joint in any way. Next it was tried on enamel paints. This kit was painted well over 15 years ago, so the paint has had plenty of time to cure and attach itself to the underlying plastic. There were several coats of paint plus an overspray of Testor's Dullcote, a lacquer based flat coat. Since I didn't have an old toothbrush, SAK was applied with a q-tip. As you can see, it successfully removed the underlying paint right down to the plastic. The raised detail of the wing was not harmed. 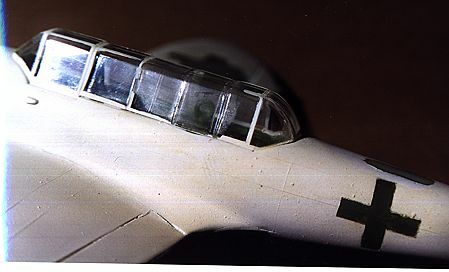 It was then tried on a canopy section of the same kit. As you can see from the image below, it slightly etched the clear parts making them a bit translucent and losing their transparency. While not incurable, something to think about. The manufacturer tells me that this should not happen unless the bottle gets frozen during shipment. Well, whatever the cause, it is something that you need to take into consideration when using SAK. The problem is not incurable and some polishing should restore it's clarity. Next was a kit of the same vintage painted with Gunze acrylics. Well-cured acrylics are supposed to be more difficult to remove with a single application. Here is how SAK fared. This is the upper and lower wing of the kit. They both had decals over the paint and Dullcote as a sealer. On the left, the SAK went through the decal and down to the plastic over most of the area. On the right, there were more coats of paint and the decal somewhat protected the paint underneath. As you can see, the acrylics will probably take a second application of SAK. SAK can be used to just remove decals, but frankly getting it to do so without also taking off some of the surrounding and underlying paint will be difficult. There are other, weaker solutions that would be better used for decal-only removal. 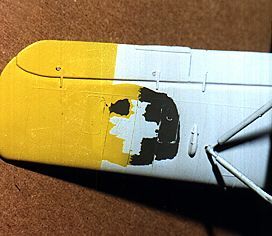 If you note the image on the right, SAK was used to remove the paint from the wing root of this kit. 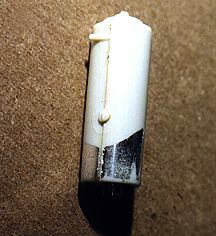 Note that the filler is left unharmed. SAK also does a great job stripping Testor's Metallizers. Unlike with other paints, SAK bubbled and fizzed. The Metallizer paint was gone in just a few minutes. 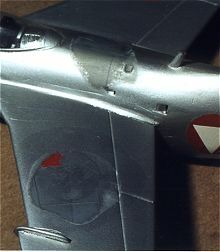 Clearly visible in this photo is the area under the decal. Again, the decal somewhat protects the underlying paint. 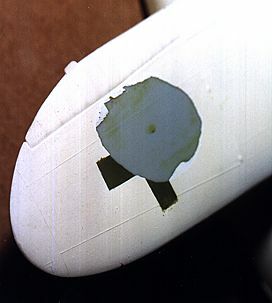 A second application is all that is necessary to remove the rest of the paint. Overall, I am very pleased with SAK, especially in its rapid removal of chrome. It is a great deal safer than oven cleaner and other household chemicals and works fast. Highly recommended.